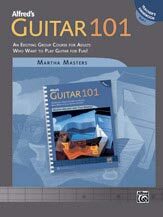 This handbook is for teachers who use Alfred's Guitar 101, Book 1, with their students. The comprehensive Alfred's Guitar 101 approach to basic guitar skills includes varied repertoire, theory, detailed instruction about seating and hand position, standard music notation, an introduction to tablature, basic improvisation, and teaches both the pick-style and fingerstyle techniques. Great for college non-music majors, continuing education classes, music dealer in-store programs, and group guitar classes at the middle and high school levels. Book 1 contains 16 units, each with a variety of repertoire, exercises, and timed tests at the end. Unit 16 provides instructions for playing 11 hit songs.